One of the things I really enjoy is taking pictures of my kids. 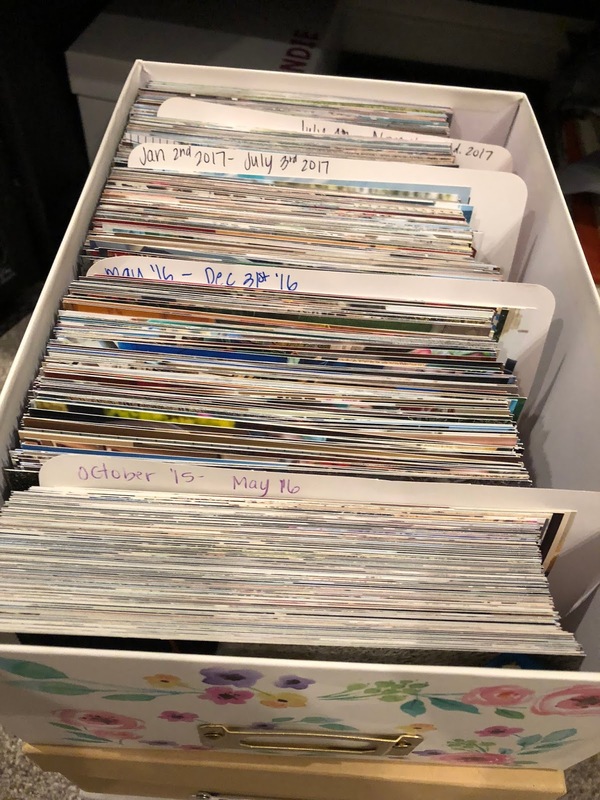 It was initially really hard for me to figure out a system to organize them when Andie was born, so I started by just making specific albums in my iPhoto. Every other month (or so) I upload the pictures from my phone to my iPhoto library and put them into the folders for each kid. 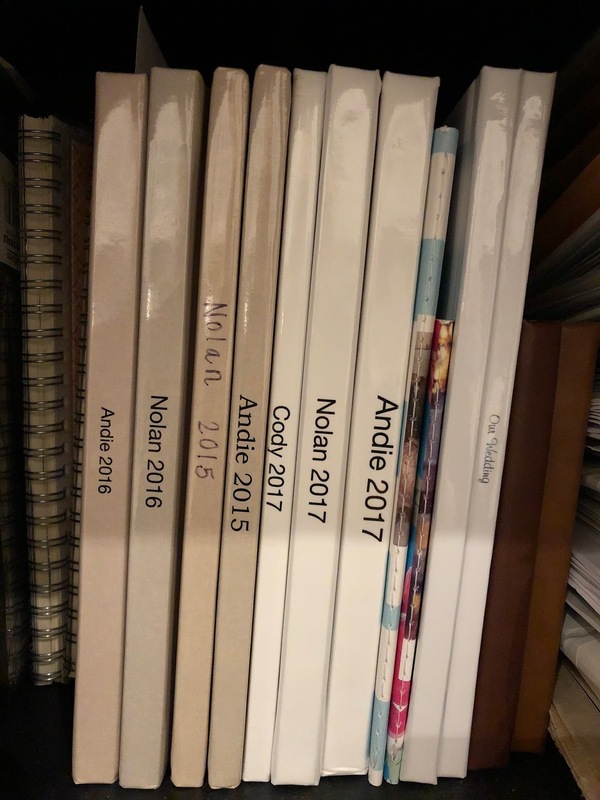 Here's how Nolan's look in my iPhoto - you can break apart the months or year however you'd like - I do it in one month increments when they're babies, then bump it up to 6 month increments after they turn 2. This just helps me stay organized! Every six months or so, I go through for each kid and drag them into shutterfly and print them. Be sure to catch them on a sale, they have them all the time! 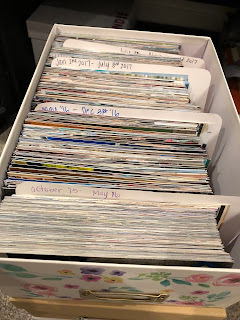 Then, when they arrive, they are usually in order by date, which is super helpful, and I just put them into these photo boxes (which I get at Michaels, usually) in chronological order. 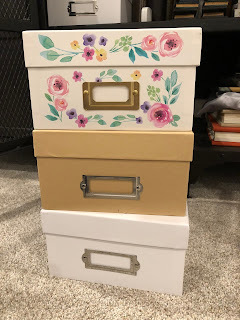 This was a great way to keep them organized - but I wasn't really doing much with them! That's when I decided to start my own little private instagram account - I don't have any followers - on purpose- because I will upload them when I have a few extra minutes and it will sometimes be 20-30 pictures at a time from my phone. I date each picture and make a note in the caption if it's something I need to remember. I try to do this every couple of weeks so I don't get behind. 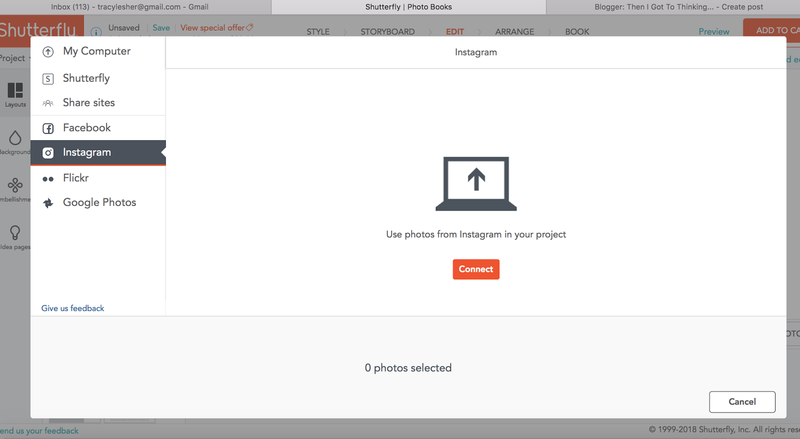 Then, at the end of the year (for example, I started this in 2015, so for 2015-2016) I login to my shutter fly account and make a custom book. You can download your photos from Instagram directly into their "book making page" and I just drag them in. It goes really fast because they're all in chronological order and it's all of the photos I love with out having to dig through all of the thousands of photos in my phone or iPhoto library. 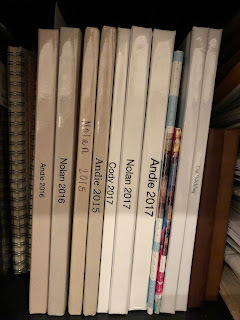 I set a goal for myself the last 2 years to get their books done by the second week of January. When I get them done early, I feel accomplished :) This month I have been on maternity leave, so that made it much easier to get them done! Now, I have a little library of books for each year of their lives. I get the 8X8 size and the kids absolutely love to look through them. I also write each kid a few little notes through out the book to remind them of specific details of the year. My favorite word to describe you is sweet… because you are absolutely one of the sweetest people I know. You will randomly come up to me and give me a kiss and tell me you love me. You are full of so much love and life. You love your family and this year was one of so much change for you, you really came out of your shell! You are getting bigger, wearing mostly 2T and 3T clothes. You have a long and lean build and are so handsome. Daddy cuts your hair and you’re absolutely irresistible when you flash your sneaky little smile. I love that daddy and I can cure almost any owie with a kiss. You love to play jokes on people and make us laugh. You are obsessed with tractors and tools. You can name pretty much every tractor (you say your favorite is an excavator) and you know most of your tools, too. We have been known to stop at construction sites while we are driving so you can watch the tractors work. You love to be outside and this year we got you your first two wheeled bicycle and you were a pro right away. You also love your ride-on toys. You love all television shows and movies, especially those that have tractors, and you love to watch ‘tractors on Pops computer with him.’ This year, while we were waiting for our house to be finished, we lived with Gramz & Pops for a little more than a month. You, especially, spent lots of time with them. At the beginning of the year you went up flying in his airplane for the first time and loved it. You told us all about how you wore “headphones” - it was so special. You also got to drive a skid steer tractor and a combine harvester on your trips out to the rice ranch. You would cry when it was time to leave! You also experienced your first “Urban Picnics”, which are what Pops did with me and your aunties when we were little (McDonald’s happy meal on the back of his pick up). You spent lots of time with him out in the man cave, too. You also bonded very closely with your Gramz. You call her “Gamz” and every night you would call for her from your bed at their house so she would come in and rock you. She was also the first person you would call for in the mornings and it was so cute to hear you yell down the hall for her! If anyone asks you your name, you will say “Noley-Bear!” In the last couple of months, you’ve become much more social and you will introduce yourself to strangers now by saying “I’m Noley-Bear! !” Daddy and I are pretty sure you will write that name on your papers when you start school. You are the sweetest big brother to Cody and some of my favorite memories from this year were rocking you to sleep and you singing “twinkle twinkle little star” to my belly. You are so affectionate… you love to be hugged and held and I can always count on you for a big, tight hug. Since Cody was born, you ask often to hold him and I almost always say yes because I want you two to bond. You are very sweet with him and have your own little voice that you talk to him with. We took two trips to Disneyland this year and you experienced so much while we were there. You loved the characters (except for Jack from The Nightmare Before Christmas) and when you met Darth Vader, or “darth mador” as you call him, you said, “you’re a mean guy!”. You played soccer this year and you weren’t really sure about it at first. It took quite a bit of warming up and a few practices (& bribery on our end) before you started to jump in and play. Once you got going, you did great and it was so cute to watch you. You’re a pretty picky eater but you love fruit, chicken nuggets, sweets and your favorite is hamburgers - especially from In N Out. Daddy and I love the way you say hamburger - you enunciate each syllable - “ham-buur-gur!” One night when we were sitting around the dinner table I asked you and your sister what you were thankful for and she said “you guys!”. You looked right at us and said “chicken nuggets” :) You are hilarious and you knew it would make us laugh. We are so crazy about you, Nolan! You are so special to us and I can’t imagine life with out you and your sparkly little smile in it. I am so proud of you and the little boy you are becoming. Never give up on what you want, stay kind, and always remember your mama is here for you and loves you no matter what!